The problem of terrorism in Nigeria continues to escalate as cattle herdsmen attack village in Kaduna state and kill over 20 people. During the unprovoked attack, more than 20 people including two security officers were killed after gunmen suspected to be herdsmen attacked a military outpost at Godogodo village in Kaduna state. Well planned attack that lasted for hours. According to residents, the attack started on Saturday October 15th and then continued into yesterday Sunday October 16th which saw the herdsmen attacking surrounding villages in Jama’a Local Government Area of Kaduna State‎. At the end of it, several people were dead. Tightened security in the area. Chairman of the interim management committee of the local government area, Humble Katuka‎, has declared a 24-hour curfew in the area. Confirming the attacks, the spokesman of the Kaduna State Police Command, Aliyu Usman, said two officers were killed during the attack at a military outpost in Godogodo. He vowed that the police will arrest those who carried out the attacks. “Last Friday, same armed men ambushed our men around Godogodo, killed two officers and fled. We shall surely get them soon”he said. 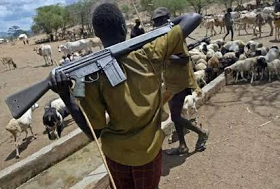 The cattle herdsmen responsible for both attacks are still at large.